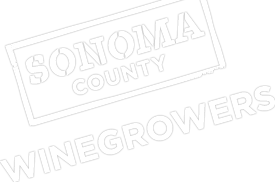 Toronto Star writer Kristin Kent recently visited Sonoma County and wrote a feature story on the bold sustainability efforts of the region’s winegrowers. She showcased the unique and varied approaches taken by Preston of Dry Creek, Benzinger Family Winery, DeVero Farms and Winery, St. Francis Winery and Vineyard, and Paradise Ridge Winery. Kent highlighted the SCW’s bold commitment to have 100% sustainable vineyards in Sonoma County by 2019. Becoming certified sustainable doesn’t necessarily mean going organic or adopting biodynamic farming practices. The goal is threefold: building economic viability, becoming environmentally sound and increasing social responsibility. The article reminds us that sustainability goes beyond grape growing exclusively. Other factors in preserving vineyard lands for future generations can include : welcoming children to the winery, careful attention to the rich soils, installing electronic monitoring devices, paying employees a living wage, curating a beneficial insectary, washing barrels and equipment with recycled water, using eco-friendly packaging, and planting complimentary vegetation like lavender, olive trees, honeysuckle, eucalyptus, fruit trees, native grasses, and on-site vegetable gardens.